By the unanimous vote of Bruce Charlton, William Wildblood and John Fitzgerald - the authors of Albion Awakening - we are delighted to announce that Geoffrey Ashe is the recipient of our Greatest Living Englishman Award. 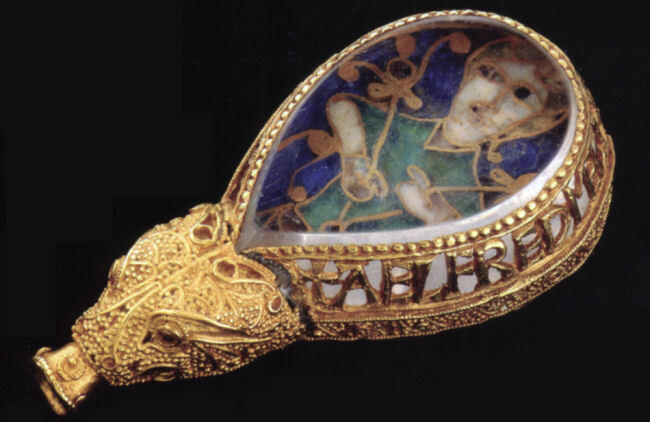 This is a virtual award, as befits a blog - and I can think of nothing more appropriate to give him than that greatest treasure of one of the greatest Englishmen: the Alfred Jewel, of King Alfred the Great. Geoffrey Ashe was born 29 March 1923. Further information on his life and work can be found here and here and here. His book _The Discovery of King Arthur_ was the first non-mediæval work I read on the topic. Excellent work. Just to say, Geoffrey Ashe fully deserves the accolade for his work on King Arthur and the myth of Albion but I'm not sure how much of a place real spirituality and the centrality of Christ has in his work so I would just want to express a slight reservation on that score. @William - A fair point - ideally I would like to see Christ upfront and central; but although I am pretty sure that GA is himself a mystical Christian, on the basis of several comments in his best and most personal books - for most of the New Agey audiences GA was addressing, (sadly) there is that reflex anti-Christian bias we have so often commented-on; so I suspect that he somewhat downplayed or back-grounded this aspect. This is a shame - but I can't think of any other living Englishman of comparable spiritual and inspirational distinction to Geoffrey Ashe, who does significantly better in this respect! Plus, there is that distinction between the systematic institutional Christianity and the heterodox, individualistic, experiential Christianity; which sometimes comes-across (especially to the orthodox) as being anti-Christian. For example, many/ most people believe that Blake himself was anti-Christian, and I can see how (approaching his work from a certain, common, perspective) they could get that impression - taking literally/ systematically some titles, specific aphorisms etc; rather than the sweep of his work. Much the same applies to Arkle - his profound and pervasive Christianity notwithstanding, some people who knew him very well (but who were not themselves Christian) thought Arkle was Not a Christian but instead a perennialist. Much depends on definitions. If the original and fundamental teachings of Blake (or Arkle) are ignored, and if the definition of Christian is taken from one of another of the creedal Christian denominations, then obviously they aren't Christian! - however, that is to beg (prejudge) the exact question that these writers are addressing. Well, I'm hardly orthodox myself so I'm not throwing any stones! My unorthodoxy would be with regard to churches not with regard to Christ though I am well aware of what a slippery slope that can be and often is.